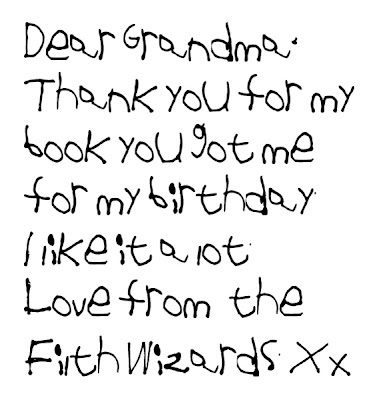 Filth Wizardry: Kid's handwriting into computer font. 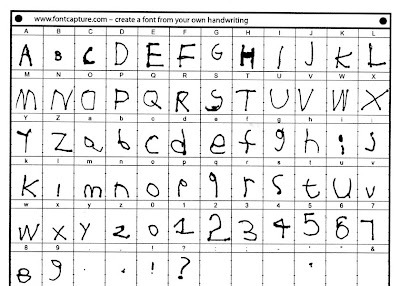 Kid's handwriting into computer font. My two girlies are three and four years old, and they are at that point where they can write letters and numbers, but can't yet read and write sentances, so I thought it would be very cute to make their "handwriting" into a font for the computer, so that we could use it for them to dictate thank you notes. A freind of mine sent me a link to this site (thanks A!) that offers a printable template that you fill in with a marker, scan and upload to them. From this they will transform your handwriting into a font for mac or pc that you can download and use as you like. For free! Thank you Fontcapture! I printed out the template and my four year old filled in the characters that she knows, upper and lower case letters, numbers and an exclamation mark, full stop and question mark. We didn't bother with half the template sheet because we don't need all the extra characters for a full font. The kids spent a good half an hour playing on the computer just typing letters and numbers in the font made from my four year old's letters. I'm part way through making a font for my three year old too. She is too young to be able to fit her letters in the spaces on the template sheet, so I'm getting her to write her letters and numbers on plain white sheets, then I'll scan them and cut and paste her characters into the template on the computer. 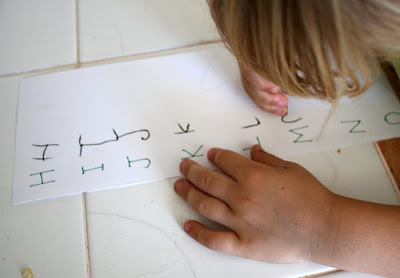 She's done her uppercase ones, so we'll do the lowercase and numbers another day. Here she is working on some of her uppercase letters. She wants to do everything her big sister can do. It's ridiculously cute. I think this will make a very sweet keepsake. It might even be nice to see if they want to dictate a "journal entry" every now and again, even though they are too young to write sentances themselves. If the service is still available in the future then I will definately be getting them to fill in a template sheet once a year to have a font per year of their young lives like a little time capsule (I am a sentimental fool). It really does make it far too easy to create a basic font on a whim. Here's one I made for the girls in just ten minutes, kind of like the bubble writing that I did for the lowercase and uppercase floor game a while back. That is such a brilliant idea! Thanks for sharing it. How fun - you come up with the neatest projects! Oh wow, what a cool site! Thanks for sharing the link, I can see us having a lot of fun with this at our house! Yet another brilliant idea! I too will be doing something with this with my kids - thanks for the link and inspiration. Very cool. When my son is a bit older this will be a lot of fun. Thanks for sharing. GREAT BLOG, Love from Cape Town SOUTH AFRICA! Great idea. Thanks for passing it along. Wow! Such fun for me let alone my son. I am impressed your kids are writing letters and numbers! I don't think my 3 year and 2 month old is anywhere near that but maybe we'll give it a try. Thanks! I shared your site and the link to the font site on my blog too. Thans for sharing it with us. We had fun this weekend making up differnt fonts. This is brilliant! My girls are too young for now, but I can't wait to do it. I love your blog - Just found it through the Crafty Crow and I know I will be visiting often. I had no idea you could do this so easily and for free! Awesome!! Wow, I used to design my own fonts, back in the day, and it took FOREVER. We'll be giving this a try for all those letters to Grandma. Wow, what a fabulous idea! I am going to link to this in my next blog about greeting cards, if that is okay! just as an FYI, this sort of free-font site usually switches to charging about $10 per font after a while - but then a new one pops up, so that's okay! So you'll probably be able to do this once a year, with a little searching. thanks for this great idea! I just finished making one with my 3.5 year old son so we could put a story he had made up in his "handwriting". But I was wondering how you managed to put more then 1 font. The website names the next font I tried to make the same and does not allow me to rename them. Thanks! Could you share the font you made for colouring in writing? That would be brilliant for making signs at daycare! Thanks! I belive there is a web www.fonts4teachers.com where you can do that easily. I am so going to try this! It isn't free anymore, but still very cool! is free (for now). The link you posted has since gone to $9.95. I have always wanted to make a font out of my handwriting! THANK YOU so much for posting the link to this site, and it's FREE! WHAAAAAT?!??! !